Mexican chocolate is quite different from regular bittersweet chocolate sold throughout the world. It is sweeter, yet with contrasting layers of flavor that seem to sweep your tongue in waves as you take a bite. It is also grainy, practically gritty. It is traditionally made from a mixture of toasted cacao beans, ground almonds, regular sugar and cinnamon. Native from Mexico, in pre-hispanic times cacao beans were transformed into a chocolate paste. In that form, chocolate was combined with water and drank every day, by the liters, by Aztec Emperor Moctezuma. It was served for him, in hand carved precious mugs and spiced up with ground chiles and sometimes honey. Only the high tier of the Aztec hierarchy had access to it, on special occasions. It was only after the Spaniards arrived that it turned into a sweeter ingredient by adding the sugar, cinnamon and almonds. From the many stories told about chocolate, one of the most amusing, is the one about a rebellious group of women in the state of Chiapas during Colonial times: The bishop gave them a warning to stop drinking hot chocolate during mass. The women claimed they needed it for sustenance through the long sermons. The bishop found the practice a nuisance and banned it. The bishop died poisoned, after drinking hot chocolate. Books have been written about how chocolate was taken to the Old World and conquered the Spanish palates first and then the French. The process of producing the chocolate bars as are sold in the general market, originated in the Old World as well. 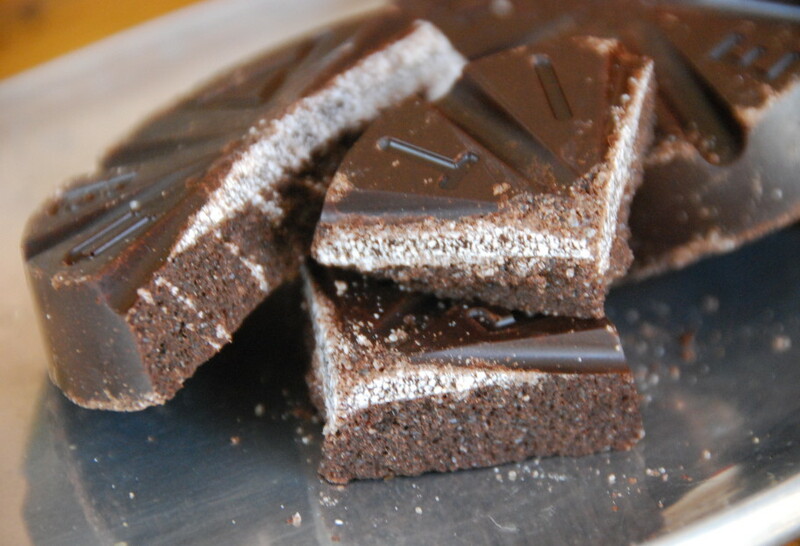 Yet there is something so charming about chocolate tablets made the traditional Mexican way. You have to take a bite into one, to be mesmerized. In Mexico there are special mills, where people and small companies bring their own ingredients and secret recipes, to be ground and turned into tablets. The aroma as one walks in the streets were these mills are located, is addicting. You do not want to go anywhere for a while… Tablets usually have the shape of balls or disks. As a little girl, and still today, I used to love to sit on the sidewalk, and carve one of these tablets slowly, with my teeth. It takes a – lovely – while to finish one. The most common way to use Mexican style chocolate is to make hot chocolate. Sometimes made with water and sometimes made with milk. Cooks that make it the traditional way, use a clay pot and use a Molinillo that is placed between the palms of both hands and quickly made to spin, as if rubbing your hands when it is really cold outside. This back and forth spinning of the molinillo, produces a thick layer of foam on the chocolate, which is most prized and enjoyed by people, as it is drank in individual mugs. There are many brands available in the US these days, that sell versions of Mexican style chocolate tablets, such as Chocolate Abuelita and Ibarra. There are even less commercial and artisanal brands like El Mayordomo and others, which come directly from Oaxaca, famous for making the tastiest Mexican chocolate. Recently I dined at a restaurant in Washington DC called Agua 301. One of their offerings was a dish called huevos divorcidados. The waiter was unable to tell me why this poached egg dish was given this name. Could you help? Please forgive any misspelling of the words–I didn’t write the name down at the time, and hope it is close enough to aid find an answer. Muchas gracias! No worries! It is called Divorced because it has two different salsas, sharing the same plate and when the dish is served the salsas aren’t supposed to be mixed. There are many dishes that use this take, sopes, tacos, enchiladas, and it just means that: 2 different salsas sharing the same plata. The one who eats it, is the one supposed to mess and mix it up! Thank you for this story and information. I am a Mexican chocolate aficionada and only buy from Oaxaca. I love Mayordomo Premio, la Solidad Canela, and Villa Real is very good also. Every morning I heat up aqua de canela, and mix it with the ground chocolate, and then pour my coffee over it, and add cream. It is heaven! I will also melt Mexican chocolate over hot water, add a little powdered ancho, pasilla y canela, and then make small drops of chocolate to put in the refrigerator to nibble on. This is also good spread over cocadas. Your show is great, and when i am home at the right time, I like to watch it! Gracias Cindy! Y Gracias Pati! My Dad was from Oaxaca and I am learning more of my roots as a way to honor him since his passing and I cannot think of a better way than to trial and taste more hot chocolate!! Im excited to have a little awareness of the rich history Mexican chocolate!! YAY!! What a great way to honor your dad, Xtina. We are interested in purchasing Mexican table chocolate for our new Mexican restaurant. We would like to serve authentic Mexican hot chocolate. Can you help us locate a distributor in or near Omaha NE. Hola Trudy, I would ask in your local Latin market!